When it comes to the floor of your kitchen, you want it to last, look good, and be easy to maintain. Though there are lots of different types of flooring options for your home. While a lot of the time people pick flooring based on look, there are benefits and drawbacks to different types of flooring that might make the functionality of your kitchen floor worth changing the look of. The three main types of flooring that is used in kitchens are hardwood, vinyl, and tile flooring. Hardwood flooring is one of the oldest types that are still in use today, mostly because dirt and hay has gone out of style. 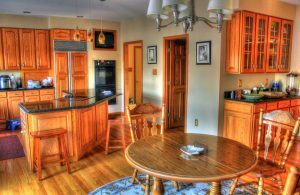 Hardwood flooring can give your kitchen an ageless look as look has become popular in recent years. 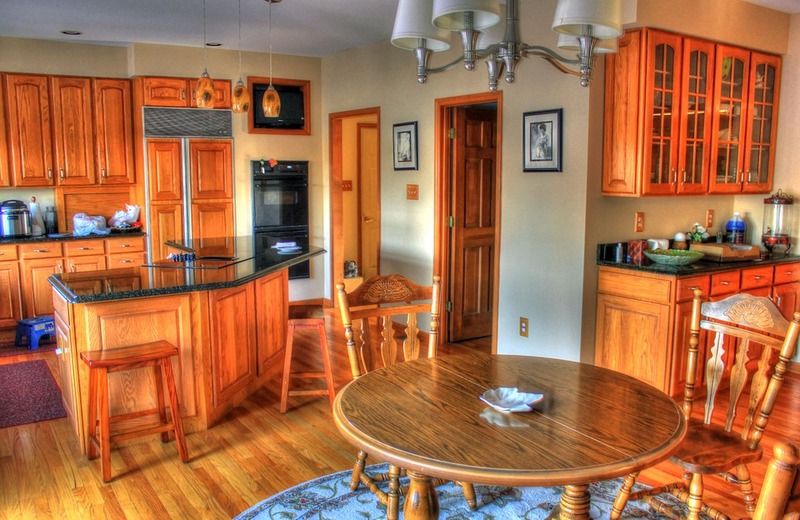 Hardwood floors are great for open floor plans. 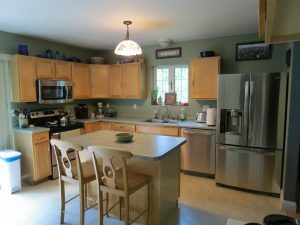 In recent years the durability of hardwood flooring has increased greatly, and can handle things like floating islands and expandable tables for expanded seating in the kitchen. Wood flooring also gives your home a warmer look and cleans relatively easy. Though with those benefits hardwood flooring can often be costly to install and maintain. Scratches that do happen in the surface need to be sanded or polished to be removed. Wood flooring is also susceptible to moisture more than other types unless sealed against it, which increases the price. Even then prolonged exposure to water can still cause hardwood floors to warp. Becoming very popular in the 1930’s, Vinyl flooring is one of the highest selling flooring types that is used in most homes, second only to carpet. Vinyl flooring is very durable, scratch resistant and moisture resistant it is a type that is designed to last. Originally the styles of vinyl flooring were very limited, but the range has increased greatly. Another appeal to vinyl flooring is the price. Vinyl is one of the least expensive types to install. While tough and affordable are great selling points. Vinyl floors do not have the same appeal as hardwood and tile over the years. Vinyl does not often age well and while easy to clean, discoloration can occur and is hard to remove. Since an adhesive glue is typically used to place the flooring down, when the adhesive starts to wear out it can cause the edges to curl or bubbles to form in the center of the floor. The flooring type with the most durability is tile. Often made out of porcelain or stone, tile floors have a durability that can not only withstand scratching, but time as well. Tile is also very low maintenance along with that durability. The hard surface does not absorb moisture as much as hardwood or vinyl. Along with that excess moisture has little effect compared to the other flooring types. Though tile does have a lot of durability, it has the worst impact resistance. Dropped items can crack the tiles or grout. Along with that tile floors are very heavy. They can cause floors to sink, and if too much movement occurs the tiles can become loose. So when looking at the different types of flooring there is more than just price and look to consider. If a kitchen is used a lot for cooking, vinyl or tile might be the best way to go. Either way an expert company like Trend Flooring and Design is a great place to go. Not only can they help you with designing, and installing your new floor. They can help you redesign the entire kitchen as well.